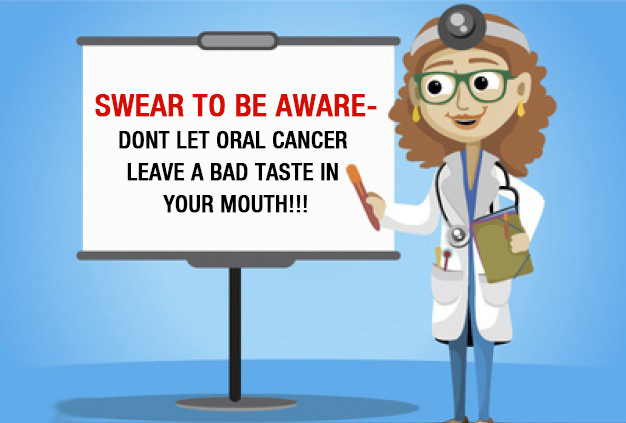 Home Body Disorders SWEAR TO BE AWARE- DON'T LET ORAL CANCER LEAVE A BAD TASTE IN YOUR MOUTH!!! 20th March is globally celebrated as World Oral Health Day and also as we have already Marched into CANCER AWARENESS MONTH (quite literally!!!) it would be a wise idea to discuss this not so welcome friend of ours. But the question arises why should we spare our precious time going into gory details of this dreaded disease? The answer to this question lies in the age old proverb “early action is the key to ensuring best results.” Awareness can increase your chances of identifying the disease at an early and possibly preventable stage. Every year the count of patients getting detected with oral cancer or pre-cancer (initial reversible stage) lies upwards of around 75,000 people including both rural and urban population. The main causative factor includes heavy tobacco exposure in the form of heavy smoking, among use of other different tobacco products. Also, the combination of alcohol and smoking (which looks as a heavenly combination for the weekend!!!) can drastically increase your risk of oral cancer to about 3-5 folds. People above the age of 50 years with tobacco consumption habit for more than 15 years are at a greater risk of acquiring oral cancer along with other forms of cancer as well. So the question arises that can you perform a self-evaluation for early detection of this cancer??? The answer is YES!!! What signs should you look for??? The presence of any oral ulcer/ sore for more than 3 weeks which does not show any signs of healing. The persistent burning sensation of the mouth and difficulty in consumption of hot and spicy food. Suspicious looking red or white patch in the mouth that has been present for more than 3 weeks. Any lump, growth, swelling or crusted areas on the gums which do not tend to heal. Difficulty during chewing or swallowing or sudden loosening of teeth. Difficulty during speaking or moving your mouth or tongue or presence of any numbness around or inside your mouth. Continuous pain or tenderness around denture prosthesis or any recent change in the way they fit. If you find anything suspicious do visit a dentist or a doctor at the earliest. All it takes is a little self-examination and timely intervention to keep this beast at the bay!! !